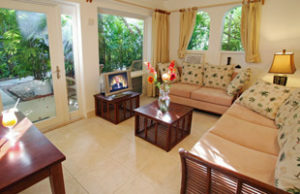 Accommodation at Siboney, the premium small resort hotel in Antigua is in suites, tastefully furnished in Caribbean style. 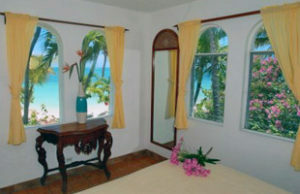 Each suite has an air-conditioned bedroom with king sized or twin beds. For natural cross breeze ventilation, switch off the a/c and open the screened louvered window. 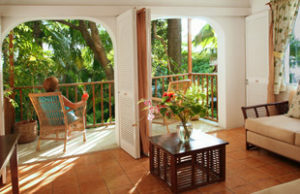 A separate lounge opens onto a patio or balcony with glimpses of the blue Caribbean sea through a profusion of palm fronds and bougainvillea. Concealed behind louvered doors is a kitchenette for the preparation of drinks and light meals. After a hard day on one of Antigua’s 365 beaches, come back to your private accommodation, enjoy a drink on the balcony, watch the birds flitting through the foliage, watch for the green flash as the sun goes down – for the quintessential Caribbean experience. At night, lie back, be seduced by the sight of the moon shining through the palms, and enjoy nature’s music: the song of the tree frogs, the sound of waves lapping on the beach, the trade winds rustling through the foliage.